So I am playing through the game once again, this time using my time doing everything possible to do. I am currently at the end of Chapter 6 and so there is this strange thing happening with my controller and I can't stop wondering if it is a Bug in the game, or if my controller is broken or if it is suppose to be like this in Chapter 6. I can't remember if this happened during my first playthrough. So whenever I am riding, my camera randomly turns by itself to the left, as if I hold down the L2 button to focus on NPC's or Animals and then it stops moving. I check the point or location my camera turns to and there is nothing there. This started during Chapter 6 and never before. I tested other games such as Division with Controller Dead Zone Settings set to 0 to be sure, but NOTHING. I have no extra controller to test with and my second playthrough have been with more bugs than my first one so I hope that it is just a bug and not my controller which I can't afford a new one at the moment. Anyone had any similar experience? Sounds like your controller stick is drifting. Does it go back to normal once you move the camera while it's drifting? You know when you hold down the L2 button when you have no weapons equipped and Arthur turns/focuses on a NPC. Looks more like that when it happens, but there is nothing there and I certainly do not hold down the L2. Also, I noticed that this happens while I move and not when standing still. Once, the camera started to turn to left again at the same time as I was about to stop moving. So when I stopped moving, the camera turned back to Arthur's back and stopped moving. My thumb was not on the R-Stick / Camera Stick at all. EDIT: I might as well add how fast it turns to the left. It is not slow how it is usually is when there is a drifting problems with a controller. More like as if I rotate or turn the camera myself [speed], not slow, but not too fast either. I am starting to believe that it is a bug and nothing wrong with my controller. I have reloaded a save file from Chapter 2 and turned the Camera Follow Level completely OFF (from "Minimal") and did not experience the issue or rotating of the camera for 30 mins or so now. So either the bug is in the Camera Follow Level Setting or in Chapter 6 (my save file or my game). As I already mentioned that this second playthrough of mine have been filled with more bugs than my first playthrough. - I had a bug where John was an invisible ghost in Bronte's House, could only see his shadow going from one door to another. - I have two extra horses in the camp, one who can follow me and one I can't do anything with (total of three horses at camp). If I try to ride on the bugged horse which it says is mine on the mini-map, I get negative honor and a message with the text "Horse theft/thief". - I have clipping issues with Arthur's Gunslinger Outfit, (sometimes his shirt goes through back of his jacket.) And that is his original outfit. - I have issues with saving Custom Outfits. Whenever I save an outfit it starts from Saved Custom Outfit Two and can only save up to number Four. No access or whatsoever on "ONE". So I can save from 2 to 4 and it skips over 1. 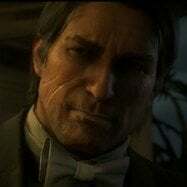 - Countless times, have I seen people holding two revolvers in ONE HAND. Did you guys check the camera follow level? I discovered it does this if its not set to high. Exactly the same issue, thought it was my stick but is the only game where it happens. There should be mandatory for Rockstar that in no way, shape or form the riding and shooting were messed up. 90% of the time you are doing one of these things if not both.